Fat Girl to Thin: Follow Along Friday!!! I talked about this a few weeks ago and what better time to start than right now. The alliteration was just too good. 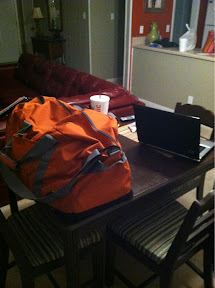 So tomorrow I am going to blog my whole day. Food, workout, everything. This is a test run for me too. I don't know how it will work on the phone and the iPad but I'm gonna give it a shot. If It works out good and is fun I'll even get some art work for "Follow Along Friday"
It's only fair to start tonight. My every day starts the night before. This is where Friday begins for me. This is the bag full of dirty clothes from the day starting at 6 am. Needs to be unloaded washed and repacked. Also the computer (which actually may have died completely tonight) and dinner. 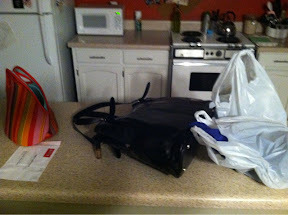 The purse, lunch box and groceries. Again everything unpacked and repacked for the next day. I was overly productive tonight. 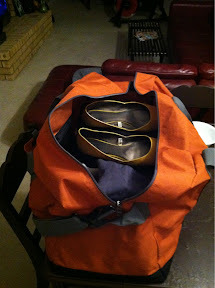 My tomorrow workout bag is packed and in the car, ready for two workouts and shower at the gym. And my lunch box is packed up and in the fridge. Just be prepared I feel lots of instagram pics coming.